You’ve likely seen one of the Redbox kiosks while running your errands but have you ever stopped at one to rent a movie? You can rent both new releases and old family favourites for just $1.50 plus tax a day (DVDs are $1.50/day, Blu-ray discs are $2.00/day and video games are $2.50/day plus tax). It’s affordable family fun that all ages will enjoy! With the holiday break quickly approaching, it’s a great time to start planning some activities that your family can enjoy together. With Redbox Canada locations at many big-box retailers, grocery stores and convenience stores, you can pop inside the store to load up on delicious snacks and grab your movie on the way out of the store. Planning a night of family entertainment has never been so easy! Simply find a Redbox location online and select your disc and reserve it. They offer both DVDs and Blu-ray discs. Visit that Redbox location, touch “pick up”, swipe your card and grab your movie. Yes, it’s really that easy! Did you know that there are more than 1,350 automated Redbox kiosks across 10 provinces? You may even have one within walking distance from your house. 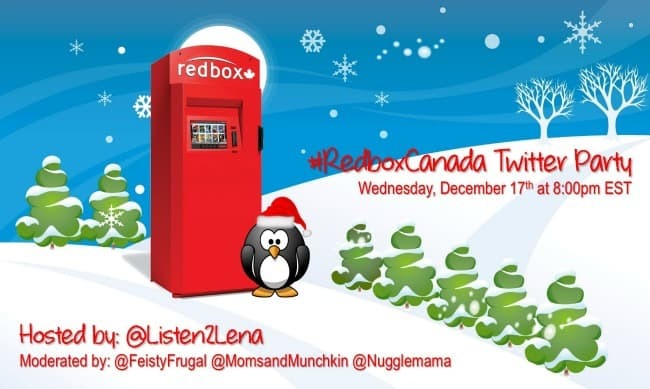 Join us on Wednesday, December 17th at 8:00pm EST for a fun Twitter Party with Redbox Canada, @Listen2Lena, @FeistyFrugal and @Nugglemama. Moms & Munchkins has a special Movie Night Pinterest Board loaded with free movie night printables, snack ideas, recipes and more for planning the ultimate movie night in with your family. RSVP for the #RedboxCanada Twitter Party below for your chance to win. We look forward to chatting with you! For movie night I put a few Mars Bars in the fridge, once cold I cut them into small pieces (about the size of a jube jube) and leave in baggies in the fridge. Then I make popcorn and while it is still hot I toss the Mars Bars pieces on it. They melt in a little and create the best salty sweet movie treat you will ever eat! Oh my goodness, this sounds so delicious! I’m going to have to try this on our next movie night. ohh I will be there with bells on, Christmas ones!! I miss my dvd player 🙁 .. never owned a blu ray but nonetheless the conversation is always fun & Lena’s parties go way too fast!! See you all there! Yes, Lena’s parties are always fabulous and I know this one will be a lot of fun. I look forward to seeing you there – good luck to you! We just used Red Box for the first time on the weekend to get movies for our sleepover night under the Christmas tree. It was so easy and I was amazed how affordable they are! I’m glad to hear that you enjoyed the experience and I hope we’ll see you at the Twitter Party!